Rejuvenating the functionality and appeal of your living space is easy when you visit our flooring store to find a new floor for your home. Our extensive inventory of stylish and affordable ceramic tile flooring in Williamsport, Pennsylvania, features products from some of the most popular brands available on the market today. As soon as you step into our showroom, you’ll be greeted immediately and receive the assistance you need from one of our many flooring experts. We are committed to ensuring that your flooring experience is a positive one from start to finish, so we do everything we can to help you throughout the process. From helping you choose a new floor based on your personal style and budget to provide a ceramic tile floor installation in your home, we have the expertise and resources necessary to provide comprehensive solutions for your flooring needs. We provide you with access to a massive selection of ceramic tile floor options that are available in a broad variety of textures, colors, and patterns. Regardless of your preference, you’ll find a style that matches your design vision in our showroom. We carry a wide selection of ceramic tile ranging in style from modern to traditional and everywhere in between. Even if you’re not sure about the type of ceramic tile that you’d like, we’ll be glad to help you find a style that complements your home’s current décor or the style that you intend to create with your upcoming interior design project. Whether you’re renovating outdated floors or starting from scratch with new construction, a ceramic tile floor provides an ideal foundation that sets the stage for the rest of your home to follow. In addition to our inventory of tile flooring, we carry a variety of ceramic backsplash options for updating the walls of your home. As a common design feature in kitchens and restrooms alike, backsplashes provide a layer of protection from damage caused by water and other sources of moisture. In the kitchen, a ceramic backsplash guards your walls against food and drink spills, as well as damage from grease and other cooking accidents. In the bathroom, a backsplash keeps your walls from getting splashed by water from your sink, shower, or bath while bringing together the design elements of your space. 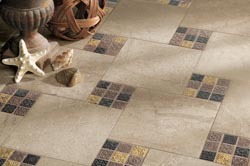 Additionally, we offer affordable ceramic flooring tile installation at Corter's Flooring America. We have highly skilled craftsmen who have extensive experience installing flooring. Contact us to learn more about our selection of stylish and affordable ceramic tile flooring. We serve clients in Williamsport, Pennsylvania.